In partnership with Alcoa Foundation, Buhl Foundation, and the City Pittsburgh, PRC is working with 1300 residents in Pittsburgh’s Northside to improve recycling rates and decrease the amount of recyclables sent to landfills. Currently City of Pittsburgh residents are instructed to place their recyclables in blue plastic bags in designated recycling collection sites on their biweekly recycling pickup day. At PRC we are working to increase City recycling rates by increasing the convenience and understanding of recycling. In an effort to increase recycling rates and participation, PRC developed a pilot project to remove some of the barriers between residents and recycling. These barriers include knowledge about what materials are recyclable, understanding the economic and environmental importance of recycling, and materials to make recycling viable in the home. Focusing on a single collection route in Pittsburgh’s Northside, PRC’s staff and interns will speak with hundreds of residents in the summer of 2015 to about recycling as well as answer their questions and provide them with their own 32-gallon recycling container free of charge. These bins will serve as an alternative to the blue bags. Residents are encouraged to work with us by separating the recyclables outlined below from the trash, and to place all recyclable materials, unbagged, in the recycling bin to be placed out at your regular collection site on the regular recycling day. Excess plastic bags cause issues to recycling plants (Materials Recovery Facilities or MRFs), clogging the machinery, reducing efficiency, and placing employees at risk. Using bins reduces the need for these bins and have the ability to increase recycling rates. This program will benefit approximately 1,300 Pittsburghers and keep hundreds of thousands of pounds of valuable materials in circulation and out of Pennsylvania landfills! 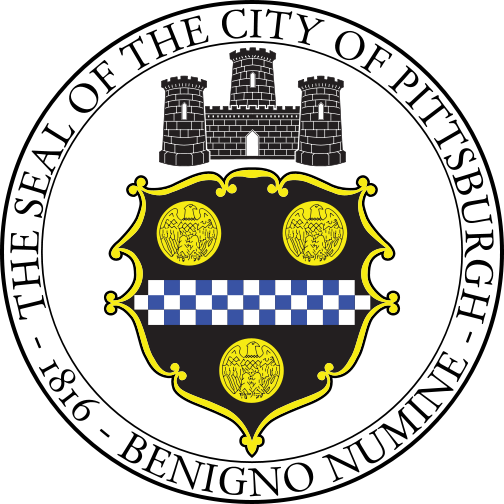 The City of Pittsburgh provides all of it’s residents with single-stream recycling. This means that all of your recyclable materials can go into the same bin and don’t need to be sorted by type. Recyclables in this section of the Northside are picked up every other Monday, with occasional changes due to holidays and weather. Simply place the following recyclable materials, unbagged, in the recycling bin and set them out at your collection site on your regular recycling pickup day. Paper – Newspaper, office paper, glossy paper, magazines, catalogs, paperboard, phone books, hard cover books, junk mail, and more. Be sure that your paper is dry and free of food or greasy residues. Plastic Containers – All plastics numbered 1-5 and number 7s. These include: beverage bottles, detergent bottles, food containers, and more. Glass – Bottles and jars of any color are recyclable. Metal Containers – Steel, aluminum, tin, and bi-metal cans and containers are recyclable. Should be wiped clean of food and grease. Corrugated Cardboard – Boxes should be flattened and placed in the recycling bin. If the cardboard is too large to fit in the recycling bin please bundle with string or twine and place next to the bin. Pizza boxes ARE recyclable if free of food, wax paper, and excess grease. Cardboard cartons – Beverage or soup cartons should be rinsed, dried, and recycled. A number of materials are recyclable, though can’t go into the curbside recycling program. Check the list below to keep your valuable materials out of landfills and in circulation! Electronics – Bring your computers, printers, cell phones to the following locations. Goodwill Stores – Does not accept televisions. HHgregg – Accepts most electronics. Does not accept televisions. Staples – Accepts small electronics. Does not accept television. Best Buy – Accepts televisions up to 32″ in size. Hard to Recycle Collection Events – Accepts televisions, tires, and almost all electronics. See link for complete list of accepted materials. Household Chemical Collection Events – Accepts listed household chemicals for $3/gallon. Appliance Warehouse – No charge to drop materials off. Duquesne Light Refrigerator/Freezer Recycling – Duquesne Light customers can schedule a pick up at 1-877-270-3521. Construction Junction – Accepts Freon-containing appliances for $10/each. Plastic Bags or Film – Bring plastic bags or film to your local grocery store to recycle. Tires – Bring rimless tires (limit 2 per day) to the following Public Works drop-off locations. Unwanted or Expired Medications – Place in the secure Medication Collection Box at the Pittsburgh Police Headquarters – 1203 Western Avenue, Pittsburgh, PA 15233. Yard Waste, Grass, and Leaves – Bring these materials to the following Public Works drop-off locations. Get answers about recycling or submit your comments about the bin initiative.